South Korea will work to better protect international refugees arriving in the country while greatly speeding up its refugee review process to help ease their pains and sort out fake asylum seekers, the country's justice minister said Wednesday. Minister Park Sang-ki said the country will also boost its assistance for refugees here so they can stand on their own. "(The government) has decided to come up with measures to help refugees to utilize their own capabilities and live independently instead of being passively dependent on support and protection," the minister said in an interview with a public relations official from the presidential office Cheong Wa Dae. Park's remarks came in response to a recent petition posted on Cheong Wa Dae's website calling for a ban on the entry of new refugees. The petition was prompted by the recent arrival of some 500 asylum seekers from Yemen on the South Korean island of Jeju, which had previously allowed foreign nationals to visit the island without a visa for up to 90 days. The island has since removed Yemen from the list of countries entitled to the visa-waiver program. The justice minister acknowledged a need to protect the interests of local residents. To this end, the minister said the government will greatly increase the number of workers involved in the process of reviewing newly arriving refugees, reducing the total amount of time needed to review a refugee to less than a year from the up to three years that it currently takes. "It will also consider not referring fake asylum seekers who are clearly seeking to take advantage of the refugee protection system to the review process. It also plans to stipulate penalties for refugee brokers engaged in illegal activities," he said. Still, the minister said entirely prohibiting any refugees from entering the country would run against the country's own interests, noting no country has withdrawn its membership from the United Nations convention on refugees. 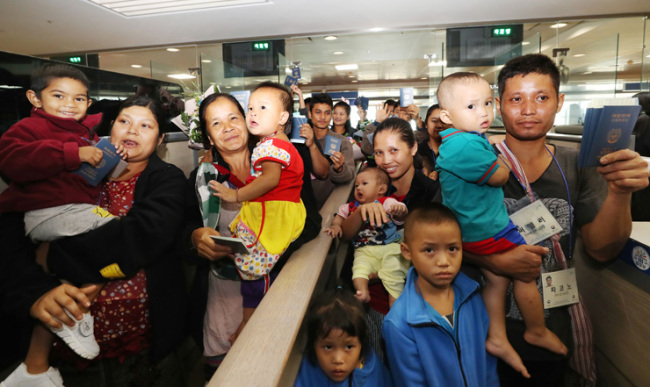 Since the country signed the convention on refugees in 1992, 42,009 people from abroad have sought asylum in South Korea, but only 4 percent or 849 have been allowed to stay as refugees. Even with an additional 1,550 non-refugees who have been allowed to stay out of humanitarian concerns, the country's refugee protection rate stands at 11.4 percent, far lower than the average 38 percent of all signatories to the convention on refugees, Park noted. "Withdrawing from the convention or abolishing the law on refugee protection is realistically impossible when considering our country's status and reputation in the international community and the effect such a move may have on our country's interests," the minister said. Park's interview by Cheong Wa Dae came as the latest of its kind under a program introduced by the Moon Jae-in government that the government will directly answer any public petitions posted on Cheong Wa Dae website that gathers support from more than 200,000 people in less than 30 days.